Should you be accepted, you will be notified after July 9. Booth assignments will be given in August. The following information will be helpful in preparation for the show. 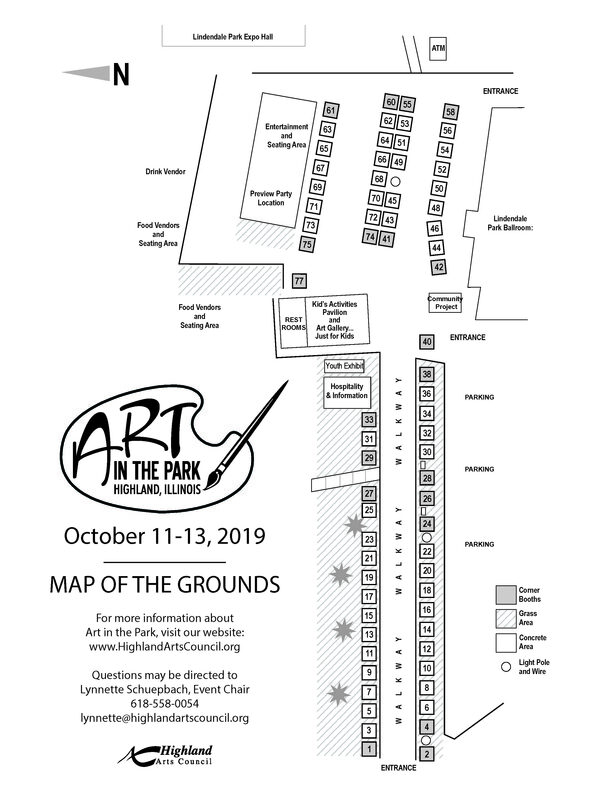 The 16th annual Art in the Park will be on October 11-13, 2019 at Lindendale Park in Highland, Illinois. Google Lindenthal Avenue and Park Hill Drive, Highland, IL 62249 to find directions to Lindendale Park. October 11, 2019: Booth setup must be completed between 10 am and 5:00 pm. Pizza will be provided after 1 pm. Booths will be open for viewing and buying from 6 pm – 9:00 pm. Wine will be served as VIP’s shop the show. At 7:30 pm, we will gather in the pavilion on the grounds for the Reception. Artists should be in their booths during the open time and can join us for the party or remain in their booths as sales continue. October 13: Show opens from 10 am – 5 pm. Artists must be present in their booths during this time. October 14: Continental breakfast will be served at 9:30 am. Awards Ceremony will begin at 9:45 am. Show opens from 11 am – 4 pm. Artists must be present in their booths during this time. Booth Discount: Highland Arts Council membership benefits include a discount in your booth fee. If you paid your membership earlier, please email Lynnette and she will refund $25 per booth fee. If you would like to become a member and receive the discount, please use the button to the right to pay the membership fee as an individual. Lynnette will refund $25 per booth fee. Booth Location Preference: Click here to download the show map or use the map below. If you have a preference of grass or concrete and/or wish to give 3 booth location preferences, email Lynnette and she will do her best to give you your booth request. Judges may be present on Friday night or Saturday. You are entered in the category of «art». Your booth assignment will be sent to you within 4 weeks. If you have given us an email, it will come by that address. If you do not have an email, we will send it by snail mail. Friday’s reception is open to sponsors and patrons who have already pledged to spend at least $100 at Art in the Park. This is your time to meet serious art buyers. At 8:00 pm, we will gather in the pavilion on the grounds (weather permitting) or in Lindendale Ballroom for the Reception. Artists should be in their booths during the open time and can join us for the party or remain in their booths as sales continue. For your travel convenience, we have a block of rooms at a rate of $97.99 (single or double) plus tax at Baymont Inn & Suites, 20 Central Boulevard, Highland, IL 62249. Their phone number is 618-651-1100. Please mention Art in the Park or Highland Arts Council when making your reservations. We would recommend making room reservations immediately. You are required to use a white tent to create the ambience of Art in the Park. It can be quite windy, so you will need to bring adequate weights to secure your tent on grass or concrete throughout all types of weather. Security will be provided Friday and Saturday nights. WiFi will be available throughout the exhibits for artists only so that you can use credit cards online. You will need to provide your own booth lighting for Friday’s Preview Party. Bring a 100’ extension cord to connect to electrical power for your booth. There is no extra charge for electricity. Each of you will receive 25 promotional postcards to help you promote the show to your customers. We will be sending them in the mail. If you need more than 25, please let us know. We are building future adult art buyers by teaching children to buy art now. If you’ve agreed to donate to the Art Gallery…Just for Kids, we request you keep the size to no larger than 11” x 14”. Please identify your art with your promotional information and booth number so that they can find you to thank you for your participation. Bring your donations with you and leave them at the hospitality booth as you check in or set up. All items will sell for $5 to children only. Adults will not be allowed to shop in the Art Gallery…Just for Kids. Proceeds will go to support the mission of Highland Arts Council. Live music will be going on in the pavilion near the booths on Saturday and Sunday. One of more community interactive artistic projects are scheduled throughout the weekend. If you have made special requests for your booth space, we will make every attempt to satisfy your request in the order in which your contract application was received and according to your exhibiting history at Highland Art in the Park.